I met a woman from Spain over 20 years ago. She made the traditional dish from Spain that she learned from her mother. My hubby cut a circle in the grass about 3-4 inches deep and about the size of the pan. He pulled the circle of grass turf off to the side and then dug a hole about 20-24 inches deep and lined the top of the hole with large stones. You have to play with the stones to get the paella pan to be level. Next we used split logs and started a fire. The wood needs to burn for quite a while to make coals to cook the paella. This way when you are finished with the fire you just refill the whole with the dirt you dug out and pull the grass turf on top of the hole. In just a matter of weeks the area will look undisturbed. It was delicious. The following Christmas she bought us a Paella pan while on vacation in Spain. 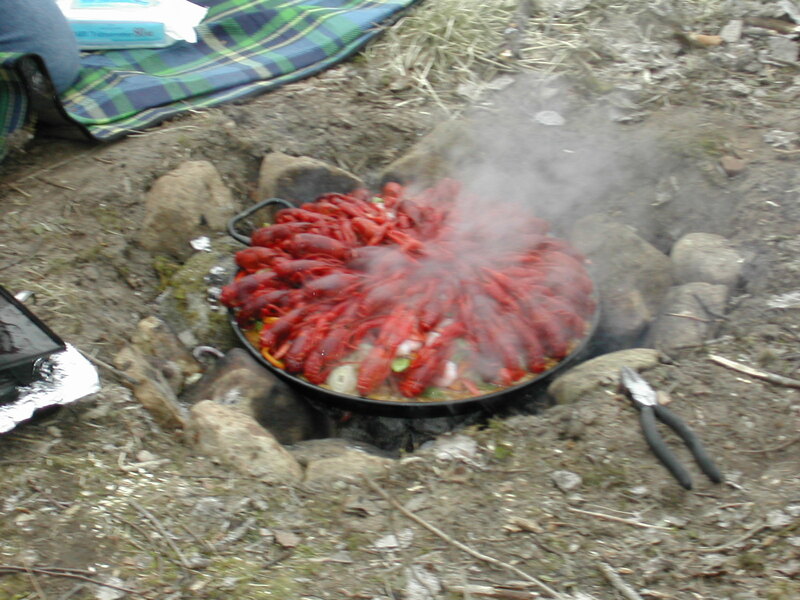 We have been making Paella for Easter every year since even if we have to dig in the snow. It marks the beginning of our outdoor cooking for the year. I have over the years changed her recipe and made it my own. My Hubby was not fond of the Octopus nor clams that she put in it. He didn’t like the Shrimp with the Shells on it. He didn’t like picking the Shrimp legs out of his food. I changed the recipe to include shelled tiger shrimp or shelled shrimp that are cooked in Dill. A couple of years later we were visiting friends in the southern tip of Sweden. I prepared all the ingredients and put them in plastic bags, boiling bouilion water in thermos and packed all the perishables in a cooler. We packed picnic baskets with everything else we needed for our outing. We took off for a drive in land and found a country park that we could swim and picnic. This park had a meandering river. It was an unusually warm. We had our friends Rune, Lily and their two young daughters with us. The guys had brought fishing poles, but spotted craw-fish off the pier. They ditched the poles and used fishing line tied the middle of a small stick. They could wind up the line on the stick to draw up their catch. They used corn on fish hooks and lied on their bellies on the pier catching craw-fish. I wish you could have seen their excitement and heard their whooping and hollering trying to catch the craw-fish. Our friends two young daughters were bored rather quickly. The guys who were suppose to show them how to catch them, took over the hooks completely. The girls ran and played on the swing set, because the guys didn’t want them splashing in the water and scaring off their catch. I was sitting on my knees making Paella and watching them. I can still see it as I describe it. Unfortunately none of us had a camera with us that day. It was like the guys transformed into the two little boys they once were before my eyes. It is a memory that is forever burned in my mind. It was one of those perfect days. I was shocked at how many they had caught. I didn’t have a pan to boil them in with us. We didn’t want them to spoil before we went home. I told them put them on top of the Paella to cook them with the rice. I pulled them off and put all the ingredients in the pan and placed them on top. Even the children fell in love with cray-fish in the Paella. It was the finishing touch of my Swedish version of Paella recipe made to perfection. This Paella recipe can be found under recipes. I will say this I prefer to cook this outdoor rather on a conventional stove top. The food taste better and cooks because of the high temperature from the fire, but it is the camaraderie it creates that is something special. We usually sit around the fire talking and laughing listening to music. I always cook extra so my guest can sample taste the chicken and shrimp as it is cooking as an appetizer. This meal takes time to cook. I guess that is because I usually cook for 20 plus people, when I make it for parties. We usually have some spirits to keep us warm while cooking it for Easter and then we carry it inside to eat. We usually drink Sangria with it as I cook as well as with the meal in the summer. We eat this outside during the summer.